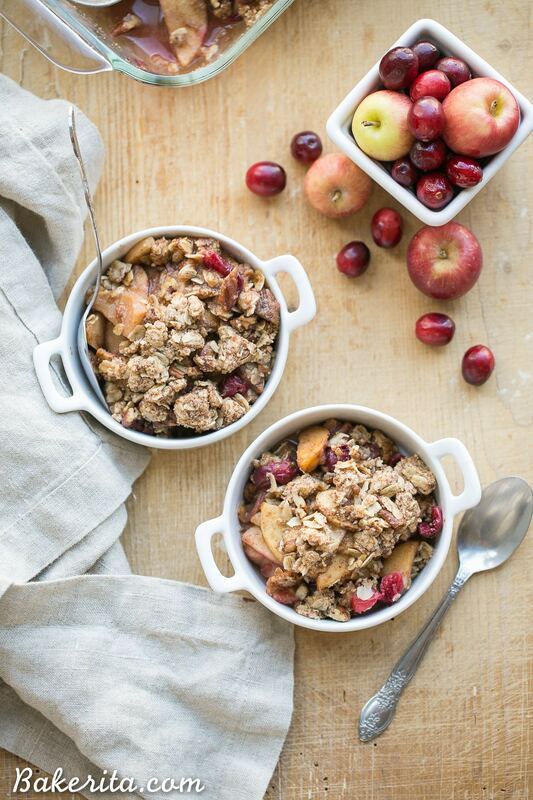 This Cranberry Apple Crisp is spiced with cinnamon, nutmeg & orange zest and topped with a crunchy pecan oatmeal crisp topping. This gluten-free and vegan crisp is the perfect holiday dessert! Are you a planner or a procrastinator? I know some of us have already had the whole Thanksgiving menu planned out for weeks now…and then there’s the other group, who’ll be running frantically to the grocery store for another bag of potatoes the morning of Thanksgiving. Which group are you in?! I’m typically in the planner group – leaving things until the very last minute has always given me anxiety, so I made sure that my family knew who was making what for our Thanksgiving feast earlier this week. There’s always some last minute drama…like the year my aunt dropped the sweet potato casserole and it shattered all over the floor and I had to remake it ASAP, so having dishes prepped and ready early leaves more time to deal with the inevitable day-of disasters. For my family’s feast, I took charge of brussels sprouts (going to make them with bacon, pecans + balsamic glaze – YUM), homemade cranberry sauce, and obviously, desserts. The Paleo Chocolate Pecan Pie I posted a few posts back is a shoo-in for the dessert table after my Aunt tried it and insisted it be a part of the feast, along with my Paleo Pumpkin Pie, a batch of Gluten Free Pumpkin Chocolate Chunk Cookies, a TBD birthday cake for my aunt, and…*drumroll please* this cranberry apple crisp! 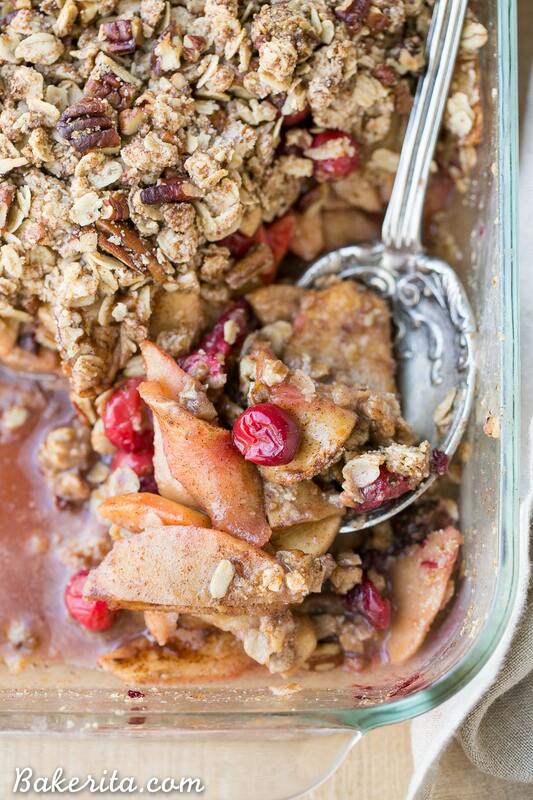 I’ve long claimed apple crisp as one of my absolutely favorite desserts, but I think this version with the added fresh cranberries takes the cake! This crisp has got everything we love about apple crisp – the juicy, tender apples coated in warm spices, the mouthwatering smell as it bakes, and the crunchy crisp topping. The fresh cranberries really help to invigorate this classic favorite though – they have such a bright, tart flavor that’s so well complemented by the cinnamon, nutmeg, and orange zest flavoring the apple cranberry filling. The coconut sugar and maple syrup add just enough sweetness to balance it all out, too. When it comes to serving crisps at events when the ovens going to be used all day, like Thanksgiving, I like to wait until dinner’s done cooking, and toss the crisp in the oven while everyone’s eating. Then, just as the feast is done, a fresh, bubbling hot cranberry apple crisp is getting pulled from the oven. Pretty ideal, huh? 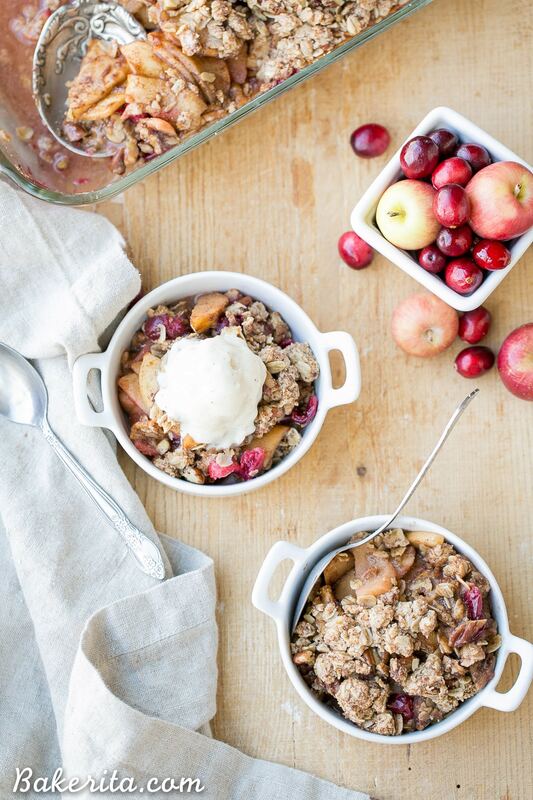 Everyone loves a hot apple crisp – especially served with a scoop of ice cream or whipped coconut cream. If you manage to have leftovers, this crisp does delicious breakfast duty when paired with some plain Greek yogurt – it’s a yogurt parfait made WAY better. 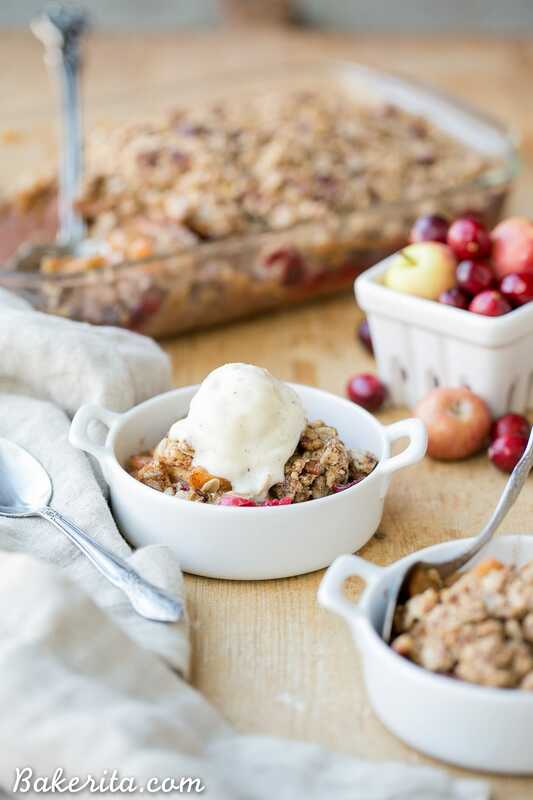 However you have it, it’s hard to resist the spiced apple cranberry filling and pecan oatmeal crisp topping of this cranberry apple crisp. Enjoy! In a medium bowl, combine the apple slices, cranberries, orange zest, cinnamon, nutmeg, coconut sugar, maple syrup and tapioca flour. Stir to combine and coat all of the fruit evenly. Pour all of the fruit filling into an 9x9” (or similarly sized) pan and set aside while preparing the crisp topping. In a separate bowl, combine the almond flour, tapioca flour, rolled oats, and coconut sugar. Add the coconut oil and using a pastry cutter, two forks, or your hands, work the coconut oil into the flour until it comes together into a course meal with no dry flour remaining. Toss in the pecans. Cover the fruit evenly with the oat topping and bake for about 45 minutes, or until the topping is golden brown and the fruit filling is bubbling. If topping is browning too quickly, tent the pan with aluminum foil halfway through to prevent burning. This recipe doubles easily if you're baking for a crowd. If doubling, bake in a 9x13" pan and add about 10 minutes to the baking time. Guess who is coming over the day after thanksgiving for breakfast… ME! Haha it didn’t happen at my house, so I didn’t have to deal with clean up thank goodness! Sounds like a major mess with your flood – yikes. Thanks so much, Traci! I’m on my Thanksgiving game and have everything planned, but that’s not always the case! 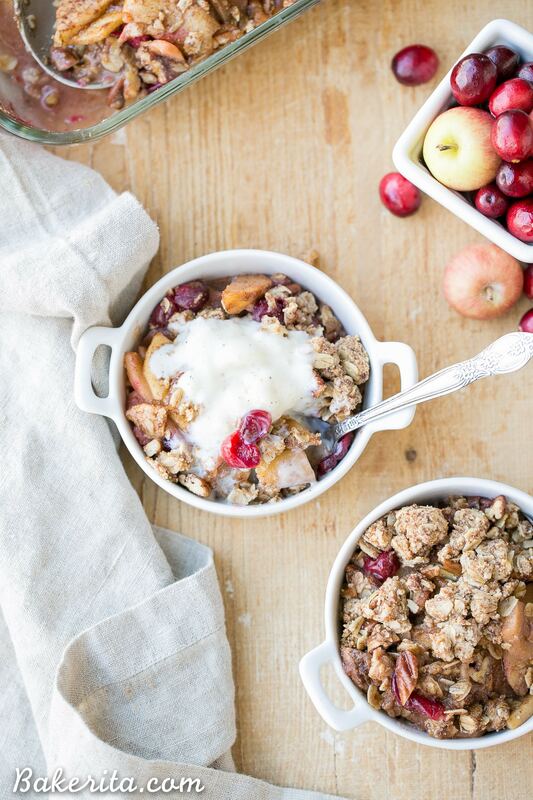 I love the apple-cranberry combination — this would make a perfect Thanksgiving dessert! I’m sure you have a fabulous menu planned! Thanks Marcie. I’m totally a planner, and if I was hosting Thanksgiving, I probably would’ve had it planned months ago! :) This crisp looks SO good, Rachel! Love the cranberry apple combo! I am sooo a planner! Except this year I am totally behind (and am therefore totally freaking out! haha). This crisp sounds just so wonderful! I’ll take one please! Haha I’m sure you’re still super ahead, even if “behind” for you ;) thanks Ashley! I am definitely not a planner. I have been in the grocery store on Christmas eve when there was NO vegetables left! Totally need to make this. What an awesome combination! Haha such a disaster! I’ve been there too. Thanks Cathleen! Forget about pie, I want to be eating this gorgeous crisp for Thanksgiving dessert! Such pretty photos, Rachel!! Drooling over here. Right?! And so much easier than dealing with all that finicky crust. Thanks so much, Sarah! Hahaha… I’m probably in both of those groups. I’m always WAY ahead on doing the meal plan, but then I also always forget something and don’t realize it until the last minute. I like to blame that on mom-brain :-) This crisp looks so delicious, Rachel! My fav pie of all time is an apple-cranberry pie so this sounds absolutely perfect (not too mention way easier than making a pie!) Love this.